The Sunshine State has always been known as a fantastic vacation spot, but Florida tourism is very much on the rise. In fact, 2018 was a record year for tourism in Florida, with a 6.7 percent increase in person trips year-over-year. Although Orlando and Miami certainly have their perks, those in-the-know will champion for the charm of West Palm Beach. As one of the three main cities in Southwest Florida, it’s known for its historic architecture, fantastic festivals, and epic waterfront views. While you’re on your getaway, it’s essential to take in the sights that are unique to this area. That includes the wealth of marine life that Florida has to offer. Whether you’re going snorkeling in West Palm Beach, sightseeing along the shore, or visiting one of the area’s wildlife sanctuaries, there will be no shortage of incredible creatures to see. If you’re ready to dive in, here are some of the amazing animals you might get lucky enough to spot during your trip. Sometimes known as sea cows, these vegetarian gentle giants are legally protected by state and federal government agencies due to how vulnerable they are to extinction. Manatee season in Florida starts in November and ends in March, which means a wintertime trip is the perfect time to meet a manatee. There are locations here that allow you to swim with manatees, while other facilities provide learning materials and opportunities to see wild manatees swim up and greet you. The Palm Beach area is home to several different species of sea turtles. In fact, over 39,000 sea turtle nests were created along Palm Beach County coastlines in 2017, meaning that many young hatchlings take their first steps right here. 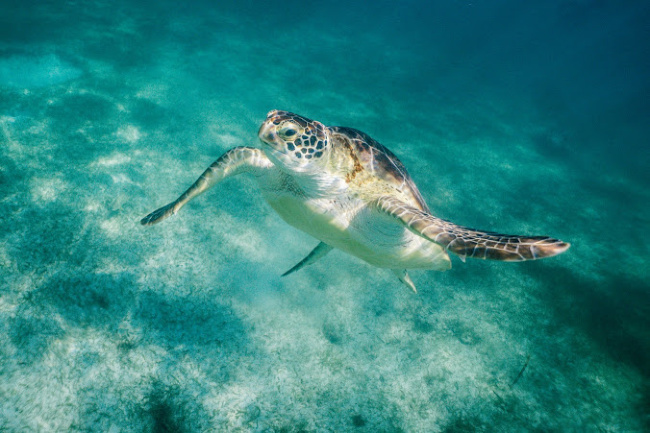 Sea turtles are typically most active between March and October, with many hotels and wildlife centers offering packages to those who want to meet these creatures or help protect their populations. You might get a chance to see green, loggerhead, or leatherback sea turtles during your trip. Although you must take care not to disturb turtles or their nests and eggs, as it’s against the law. Approximately 8.38 million participants went snorkeling in the US during 2017, and there’s no better way to get up close and personal with Florida’s schools of super-sized fish. There are angelfish (which sometimes can be up to two feet long), snappers, and goliath groupers, as well as tuna, sailfish, and swordfish. Whether you want to go scuba diving or simply fishing, there’s little doubt that West Palm Beach offers a wide variety of fishy friends to see. 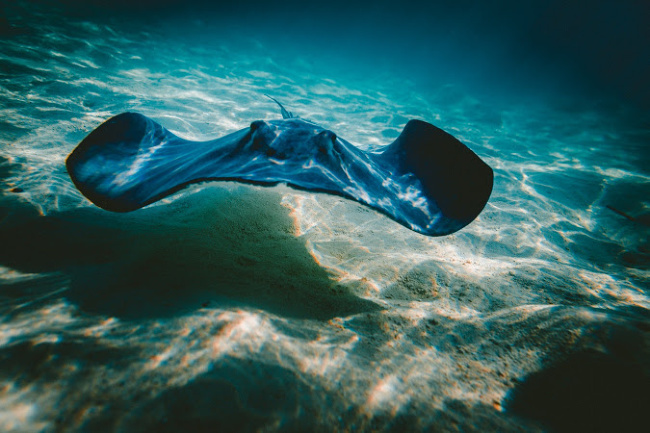 There are several different rays you might see in West Palm Beach, including manta rays, cownose rays, stingrays, and more. There’s even a new species that was recently spotted in the area. They may be distant cousins of the shark, but they’re actually more docile than dangerous. While rays do have stingers, their first instinct is to swim away at the sign of trouble. Sharks, on the other hand, are certainly amazing but should be observed at a distance. You may observe nurse sharks, Caribbean reef sharks, tiger sharks, sandbar sharks, whale sharks, and others if you explore the waters here. If you’re a fan of Flipper, you’re in luck. There are several dolphin encounter experiences you can take advantage of during your trip to West Palm Beach. There are tours, swims, aquariums, and other adventures that will allow you to see dolphins from afar and up close. It’s best to do your research before booking a reservation with one of these companies to ensure the whole family can partake. You can even skip those experiences entirely and simply hope to see some during a boat ride or a walk along the waterfront. When you plan a trip to West Palm Beach, you’ll want to leave room in your itinerary to appreciate the marvelous marine life in this area. There’s truly nothing like this natural beauty to begin or end your vacation on a high note. I would love to go snorkeling there someday. An amazing bunch of things to see under the sea. We hope to go to Florida this summer. 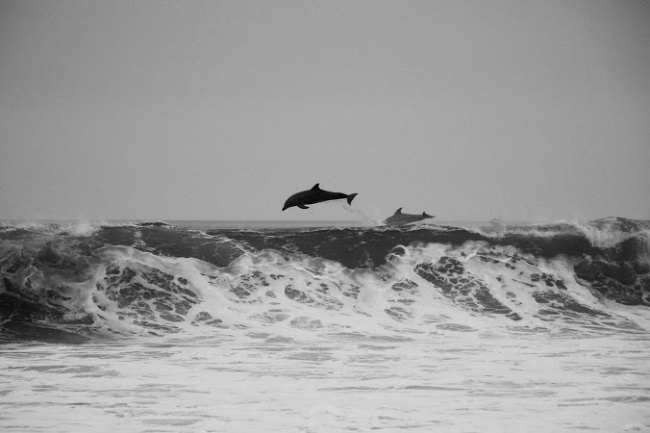 I can hardly wait, I want to see as many marine life as I can. Swimming with dolphins would really be fun, the Grandchildren want to do that also. I love Florida and West Palm Beach! I lived in Orlando for 3 years during my college days. I am so sad that it has been more than 10 years since I have been there. I hope to visit this Summer though! 🙂 This is a great guide, thank you so much for sharing! We live in Southeast Michigan and have not been to West Palm Beach, yet, but I am sure we will be eventually. Our youngest daughter lives in Daytona/Ormond Beach area and a couple of different years we met her in Orlando to spend a long weekend with her. My husband and I are SOOOO crazy in love with all animals. We are basically both obsessed with them and meeting any of them is kind of like a stereotypical teen meeting their celebrity idols haha. It was on our Bucket lists to meet and kiss a dolphin which we were able to do at Discovery Cove in Orlando, as well as other bucket list experiences of hand feeding Sting rays and swimming with them and the dolphins and petting both. The stingrays were so sweet and friendly! We love them even MORE now that we got to know some! We met and interacted with other amazing animals too, it was a dream come true. It IS high on our bucket lists to meet the Manatees in Florida now in one of the ways you were mentioning, probably the one where we get to have a guided swim WITH them with safety rules to protect the manatees of course. I think that will be the next thing we do next time we fly out to Florida. I’d really like to see manatees. I know they get injured a lot by boats, so I’d want to do it in a way that was totally safe for them, but I’d love to see them.